Anyone who has ever sifted through the full-on version of the FAR/AIM manual knows it reads with all the delight of the IRS Tax Code. My copy has post-its and highlighter throughout the section that covers IFR flight, because I know my CFI, Jim Hunt, is going to ask me about these items at every Instrument Proficiency Check. If not for the various flags, I'd be stuck digging deep to try and find relevant answers. But now, the problem of having a “War and Peace” length FAR/AIM has been solved for Private and Sport Pilots, by CFI Jason Schappert. "There are over 1,200 regulations in the FAR/AIM,” Schappert said, “however only about 100 of those concern Private and Sport Pilots. We pulled out all the fluff leaving only what you really need to know for your Sport/Private Pilot certificate. Each regulation is transcribed then broken down into plain, conversational english. Regulations are even tagged as "Popular Checkride Questions" so students really know where to study hard." 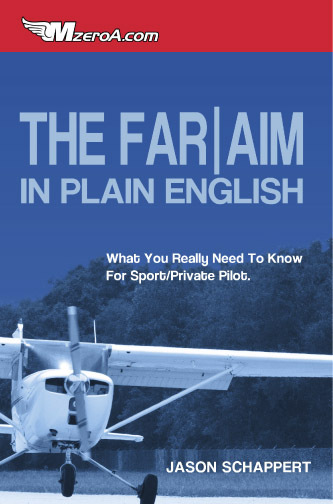 This book is a MUST BUY (after all it IS the Christmas shopping season hint hint) for any Private or Sport pilot, and especially for any student pilot. It reads easily, due to editing by Benet Wilson, a long-time Twitter #Avgeek and new addition to AOPA's social media team. Click the banner ad above to buy this book right now, you will enjoy it. Schappert's book is available as an eBook or as paperback through Amazon...and any books bought through the ad above helps to support the Airplanista blog.